October came in such a hurry. Soon our days will be filled with pink ribbons, halloween costumes and fall festivals. But some of my favorite days of October are often overlooked. October is Dental Hygiene Month and yesterday was National Child Health Day. 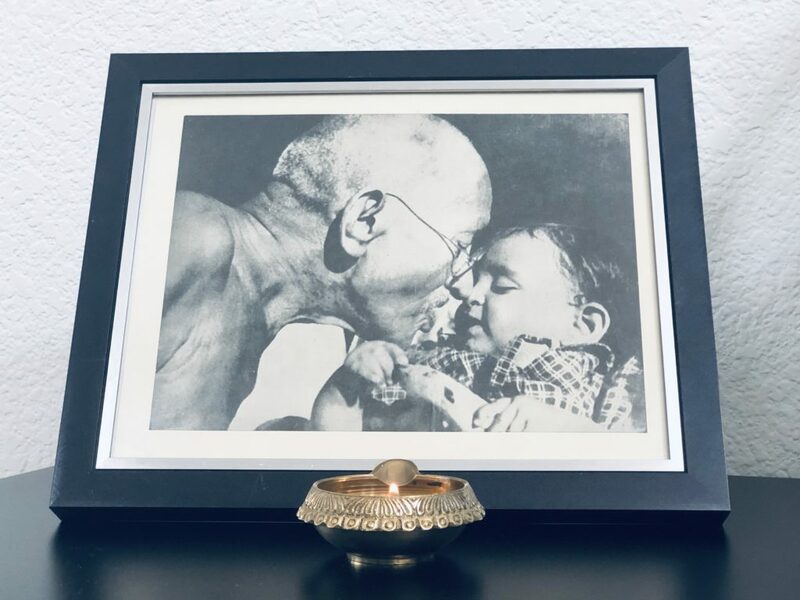 Today also happens to be Gandhi’s birthday and as a dentist and public oral health advocate, this trifecta brings me to smiles. Every minute that I am not sharing here on this blog with you, I am finding ways to make oral health accessible to the underserved populations of California. I love what I do and I love the smiles that come with it from the community. Here at home with my own kiddos, I have some awesome tools that bring on daily smiles and keep my kids healthy. The triple head toothbrush: I got this at an oral health conference and love it for my kids (there are adults ones too!). It’s reassurance for me that all their tooth surfaces are brushed each time when they use it…especially with my 2 year old’s molars when he is ready to move on from brushing before I am. It’s especially great for special needs kids/adults if that is a concern for your home. Stainless steel tongue cleaners: We’ve talked about how this is a great Ayurvedic tip and is great for the whole family. Getting kids into the habit early is key and this type has handles that are easy to grip. Gum Chucks: the owner of this company approached us years ago and we are glad to see how popular fun flossing is becoming with their products for both kids and adults. I like the reusable handles and how easy it makes flossing correctly in a C shape. Natural toothpaste: Nowadays, there are so many toothpaste brands to choose from and many contain additives that as a natural momma, I am not too fond of. To satisfy my family’s dental needs and natural lifestyle, I found Hello products. I love that their yummy flavored pastes are vegan, never tested on animals (Leaping Bunny Certified), made in the USA, free from dyes, sls/sulfates, artificial sweeteners/flavors, micro-beads, triclosan and gluten. Even their packaging is recycled materials and BPA free with no phthalates. My kids love it in watermelon. Timers: Whether it’s just off your iPhone or this traditional dollar store timer that I prefer (see below), all of us, kids and adults, should get in the habit of brushing for a full 2 minutes. Sometimes we play a fun song and jam out until it finishes while brushing together!